"He was willing to make concessions for the best interest of the country, the country as a whole, not just his dimension," Sen. Olympia Snowe said. "That's what we have to return to, on both sides, for that matter." WASHINGTON (NEWS CENTER Maine) — Among those invited to attend the funeral of former President George H.W. Bush were former Maine Gov. 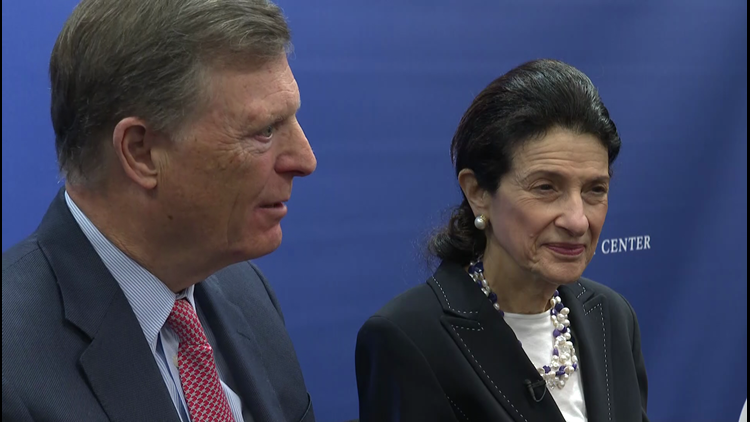 Jock McKernan and former Maine Sen. Olympia Snowe, who now is a senior fellow at the Bipartisan Policy Center in Washington, D.C., an organization that works to restore civility and cooperation in politics. Snowe was in the room in 1991 when then-President George H.W. Bush called together a bipartisan group of lawmakers to hear their thoughts on the possibility of having to go to war against Iraq for its invasion of Kuwait. It was a very tense time, especially when talks failed to produce a peaceful resolution, and Congress eventually voted to allow the president to use force to end the conflict. "I remember saying to myself," Snowe said, "'thank God he is commander-in-chief,'" because of his depth of knowledge and experience, but also because of his willingness to bring lawmakers together to reach consensus. That is something that both she and her husband said we have lost in politics today. "He was willing to make concessions for the best interest of the country, the country as a whole, not just his dimension," said Snowe, speaking of the late President Bush. "That’s what we have to return to, on both sides, for that matter." McKernan and Snowe also had a personal relationship with George H.W. Bush and his wife Barbara. They all supported each other’s campaigns and worked together on fundraisers. Snowe and McKernan related stories about how kind, generous and considerate he was of everyone, no matter their background or station in life. Even when he lost his bid for reelection — a loss many attributed to his compromise on adding new taxes after having pledged "no new taxes" during his campaign — he was gracious in defeat. McKernan recalled that in that time when he could have retreated into himself, George H.W. Bush instead reached out to thank the people who worked on his campaign. He invited McKernan and Snowe to Camp David, along with several others, as a way the thank them for their support. "That’s just the kind of guy he was," McKernan said. Both McKernan and Snowe said they hope his legacy of compromise, compassion and moderation will lead Americans and our politicians back to a period where we can all work together to solve the problem we face.